Oops - we don't appear to have a video for the MobileOffice D428. The Plustek MobileOffice D428 is the newest new member of MobileOffice series. The D428 is an easy to use, high speed scanner with a compact design that is ideal for vertical markets that need to scan plastic cards, as well as mixed sized documents up to 8.5x14". Bundled with the latest version of DocAction, the MobileOffice D428 lets you send documents to pre-selected destinations by simply pressing a button on the scanner. Images can be saved in various digital formats such as Word, Excel, Image formats, or printed. The pre-programmed interface provides six function settings which include: Scan, OCR, E-mail, Copy, File, and three custom functions. Any of the pre-programmed functions and custom functions can be completely customized to meet the user's needs. The Plustek MobileOffice D428 provides fast-scanning speed and can scan both sides of a standard 8.5X11" document in 2.2 seconds. The scanner can scan plastic embossed cards up to 1.2mm thick. 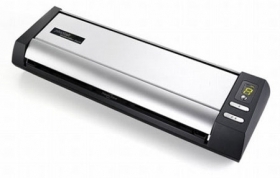 The scanner features dual CIS sensors that eliminate warm-up time and allow simultaneous scanning of both sides of the document. The D428 also features a robust transport mechanism that just about eliminates jams and misfeeds. No need to sort documents by size before scanning. No distracting large black borders. No need to re-scan skewed documents. Better readability of image files. No need to rescan documents that are scanned upside down. Higher OCR accuracy for forms processing applications. Better human readability of single sided documents. Automatic Color Matching - ability to embed color profiles in image files. Auto Density - Histogram stretching. Can make image file look better than original. Because the D428's footprint is less than 4" by 12 ", the scanner can be deployed practically anywhere. A choice of paper output options, straight through or vertical provides added placement flexibility. In addition, the design allows users easy to clean glasses and rollers. The compact design makes it easy to use the D428 in any space constrained environment.